We had our final work volleyball game last week. We hadn't won a game all season, not a one. But I had an ace up my sleeve - this inspiring sign I got from a Washington Team Tennis exhibition. Surely the sign would do the trick! I showed it to my coworker and he said "Shouldn't it say 'Refuse to Win'?" Aww, but we've already been doing that, I said. As previously discussed, I have nothing to offer the volleyball team other than the ability to hold this sign, which is a job that a post could easily do. 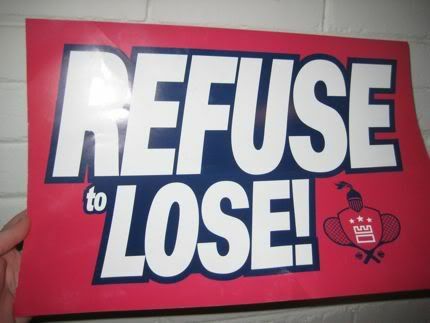 Nonetheless, the "Refuse to Lose" mantra spurred us to victory and we scored our first win, just in the nick of time. It was the only variable compared to the other scads of games we lost, so I believe the sign is directly responsible for the win. In other sporting news, I also joined a mixed doubles tennis team, and I believe the team captain might've been under the impression that I am a better player than I actually am. I went to my first match and my partner and opponents were really, really good. We lost the first set in 20 minutes and I was a disaster - dumping the ball in the net or spraying it all over the court, making a bad line call, the works. I was mentally composing a speech about why I needed to quit the team when something miraculous happened - we started winning. My partner told me just to smile and have fun, and we ended up winning the next set and the tiebreaker, even though the other team clearly should've won. August 18, 2009 by Adele Chapin.